Playing tag games is a popular youth camp activity and is a tradition for youth of various ages while at a school, camp, park, or retreat. The basic game requires no specialized equipment, clothing or shoes, making it a fast and simple game to begin playing at any time for a few minutes or longer in order to keep teens occupied and having fun. Of course, over the years, both youth and adults have developed variations of this field activity, including ones that require some equipment to keep it interesting and different. The idea here is that everyone is it. Spread out in a field and have one person yell “GO” to start the game. If you’re tagged, you must take a knee. Last person standing wins! Anyone interested in tag games will want to try this one because it builds camaraderie between players. The teenager who is it clasps the hand of another player before they progress as a team to collect more people as part of the chain. Only the player with a free hand can catch another person until everyone is part of the chain. The player who is it is named Mr. Wolf. This player stands with their back turned to the other players on the other side of the field. These players ask Mr. Wolf the time. The player who is it might say it is 5 p.m. This leads to the opposing players taking five steps toward Mr. Wolf. However, Mr. Wolf eventually answers that it is dinnertime, meaning a chase begins to make the players return to the starting area. The first player tagged is the new Mr. Wolf. This game requires people who are tagged to remain completely still when tagged by the player who is it. Standing with arms outstretched or in a funny pose is a common additional rule that youth find enjoyable. This tag game has a twist allowing untagged players to unfreeze tagged players with a simple hand touch. Players start spread out with plenty of room in-between them. A leader yells “STEP” and each player must take one step in any direction. Once tagged, a player must sit down. They can no longer move but are able to tag players within reach as they pass by. This variation of tag uses one piece of equipment that is easy to find. The can is placed on the field as the other players run away to hide. The player who is it attempts to find and tag the other players who are then placed in jail. Any untagged players can find and kick the can to free all the prisoners. The player who is it throws a ball made of a soft material into the air in this game. While the ball is in the air, the other players run but must stop as the player who is it catches the ball. As the ball is caught, the player who is it yells the word spud, leading to the other players freezing. The player holding the ball takes three steps toward any player before attempting to hit them with the ball. The hit player becomes the new player who tosses the ball into the air. This field activity offers a combination of two popular games with additional elements of the game hide-and-seek. Several players run and hide while another player is it. The youth who is it must seek out the hidden players to tag them until all are found, leading to an end of the game. This variation of the game has players split between two teams with one being called cops and the other robbers. Naturally, the cops are responsible for tagging the robbers, causing them to go to a designated area that is considered jail. The game ends when all the players are tagged and in jail. Two robbers can tag one jailed robber resulting in a jailbreak too! 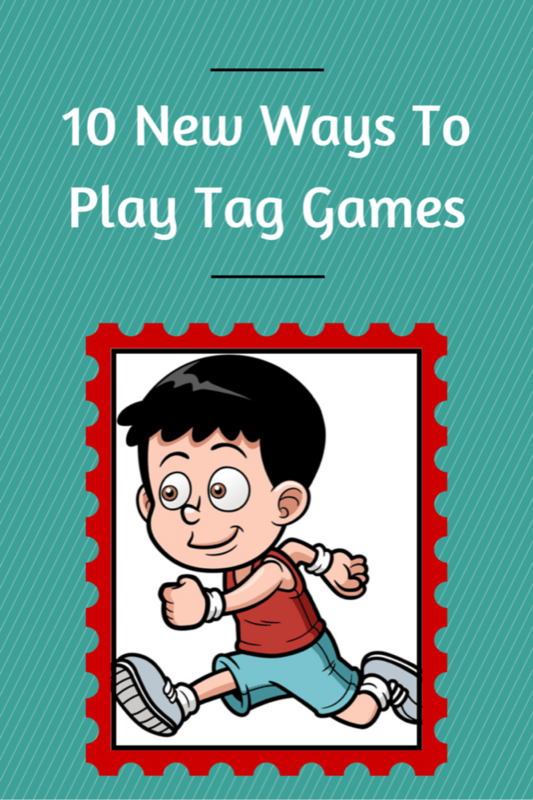 Thanks to WOL Camps for making this article on new ways to play tag games possible.